This study of church discipline cases describes a system of subjection with obligations for all--men, women, parents, children, masters, and servants. 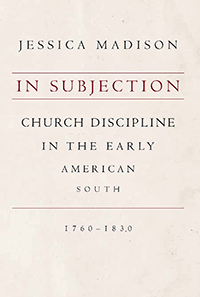 Although many historians have mistaken this for "oppression," most Southerners accepted the idea of "subjection," regarding it as a divinely ordained system for their mutual governance and benefit. Using Baptist church record books from across North and South Carolina, the author invites readers to sit in on business meetings of the past to see how churches regulated the behavior of their members. Chapter 1, "Subjection: A Cultural Consensus," describes this system of subjection that encompassed members from all walks of life. Chapter 2, "Unity and Discord," examines cases of general contention between church members, demonstrating that churches expected brothers and sisters to submit to each other in Christian fellowship. Chapter 3, "Crucifying the Carnal Man," focuses on discipline cases wherein men were brought under subjection to church standards. Chapter 4, "Fellowlabourers," examines financial matters, demonstrating that while expectations varied for men and women, they both bore financial responsibilities as church members, and both were held equally accountable for their secular dealings. Chapter 5, "Promiscuity and Marriage," concentrates on the relationship between husbands and wives, a common symbol of Christian subjection. Complete with a map and statistical tables, this book argues that church discipline bound everyone together in mutual subjection to a shared code of conduct rather than empowering white men exclusively with a position of authority over others.